Today's SIL leaves the diamond and heads onto the frozen pond. Now, I am a Blackhawks fan, but can appreciate most of hockey (except Tim Thomas, most of the Canucks and the entire history of the Dead Wings minus Howe and Yzerman). Hockey cards are difficult to come by as really only Upper Deck is still in the hockey business, and that's probably just cuz of Topps exclusive baseball contract. 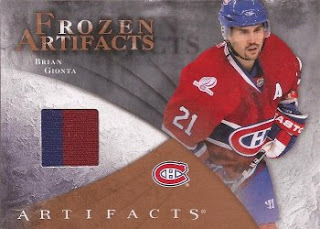 This Brian Gionta jersey card came from a blaster of Artifacts last year. Gotta give props to the Montreal franchise. All the championships - none of the jerkness of the Yankees (for the most part). If you look at the card, you can see le Canadians 100th anniversary patch on Gionta's right shoulder. Montreal wore 5 different throwbacks during the 2008-09 and 09-10 season, along with their standard sweater depicted on the card photo. But if you look close, that swatch is not from the standard jersey. Nowhere on their regular uni does blue and red touch. So this is a swatch from one of the throwbacks. And this is not a "no specific event" swatch but game used. A quick look at the link, and a little comparison, we come to the conclusion that this is a piece of the barber pole unis worn just three times. However, Gionta was a Devil at the end of the 2008-09 season, so the only game of the three when he was a Hab when this jersey was on the ice was Oct 31st, 2009. And look - here is a picture of Brian in the uniform pre cut up (I'd post that here, but I don't need Getty getting all upset, so I'll link). Somewhere, on his body, is this particular area of material. All those Encyclopedia Brown books I read as a kid paid off on that bit of sleuthing.